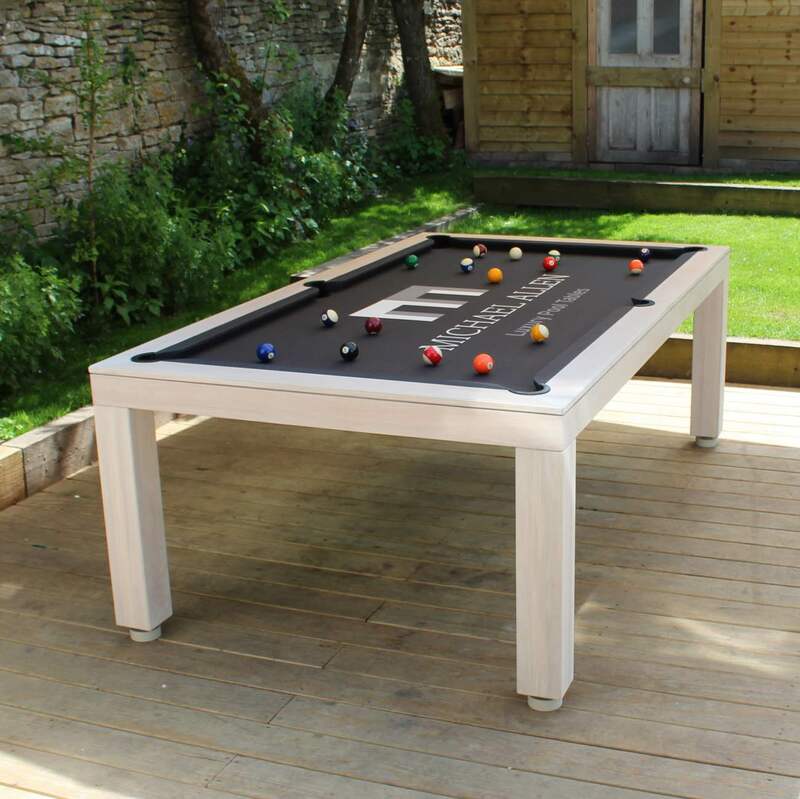 The Outdoor Pool Table is available in either 7′ or 8′ sizes in either English Pool or American Pool. A dining top and waterproof cover are included as standard. There are several customisable options so we suggest contacting us to talk through your options. We recommend 7′ for English Pool or 8′ American Pool. A dining top is included as standard because even if you don’t intend to use the Pool Table as a dining table, you require a dining top to stop water pooling in the middle of the waterproof cover (also included). The customisation options available with this table such as the wood colour and cloth options are detailed below. Please contact us now so that we can explain the different options to ensure you get the right table to suit your needs. The table has been constructed especially to be resistant to outdoor weather conditions. Our prices include free accessories, which includes 4 cues, balls, triangle, table brush and 12 chalks to match your table cloth. Alternatively you can choose to upgrade to premium accessories for at a discounted price of £200 (this includes 4 x higher quality cues, Aramith balls, matching cue rack, matching triangle, table brush and 12 chalks to match your table cloth). * Either option is included in the price. We recommend our UV resistant Simonis 760 cloth which has been specifically designed to be used on our Outdoor Pool Table. It does not absorb water, which makes it possible for use in rain and snow. This cloth is only available in a Petroleum Blue colour. If you would like a different cloth colour, the other recommended option is the Strachan Superpro with SpillGuard, this cloth does not offer the same protection as the Simonis 760 Outdoor cloth but if looked after it should keep well for a long time.